Chandler, Arizona – Not even the “polar vortex” could stop Koh Young America from holding a highly successful IPC APEX Expo in San Diego during the last week of January 2019. 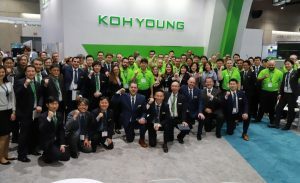 “Despite the weather in the Midwest and New England, Koh Young America is very pleased with the outcome from the IPC APEX Expo,” said Juan Arango, Managing Director at Koh Young America. During the show, Koh Young America earned a pair of the CIRCUITS ASSEBMLY New Product Introduction (NPI) Awards. In the category of “Process Control Software”, it received an award for the Koh Young Process Optimizer (KPO). In the category “Test & Inspection for SPI (Solder Paste Inspection)”, Koh Young won the award for its Auto Repair function, an option for its industry-leading SPI systems. The NPI Awards recognize the leading new products for electronics assembly during the past 12 months, as determined by an independent panel of practicing engineers who selected the honorees. Koh Young Auto helps manufacturers improve quality and productivity by integrating an automated paste dispenser into its 3D SPI systems. Combining an SPI and a dispenser helps prevent insufficient solder, so manufacturers can reduce costs by eliminating board scrap or rework. “When our SPI is configured with the Auto Repair feature, manufactures enhance first pass yield and reduce operational costs,” said Joel Scutchfield, Koh Young America Sales Director. “The 3D SPI becomes more than an inspection system, it becomes a process optimizer”, he concluded. Koh Young has been driving toward the smart factory for years and we showed our resolve in several ways at APEX. “Not only did Koh Young proudly participate in the IPC Connected Factory Exchange (CFX) and Hermes demo lines, we highlighted numerous ways we can convert our true 3D measurement data into actionable information,” said Brent Fischthal, Sr. Marketing Manager at Koh Young America and an IPC CFX Committee member. “Complementing the CFX and Hermes standards, Koh Young KSMART uses the latest artificial intelligence technology to help manufactures realize a smart factory.” Throughout the show, Koh Young presented how its new AI Platform intelligently applies real-time data to improve the production process. Koh Young integrated additional solutions in several of the demo lines at some of our partners, which included ITW EAE, Panasonic Factory Solutions, Fuji America, Cogiscan, and Eunil. As IPC APEX Expo concludes, we now turn to NEPCON China, where Koh Young will highlight its latest innovations for the inspection market, including new hardware and software solutions that drive production and process improvements. We welcome show attendees to visit us in the Surface Mount Technology Pavilion at the Shanghai World Expo Center during 24-26 April 2019. If you cannot attend the show, you can learn more about Koh Young Technology and its best-in-class inspection solutions at www.kohyoung.com.If you missed the show, you can learn more about Koh Young Technology and its best-in-class inspection solutions at www.kohyoung.com.